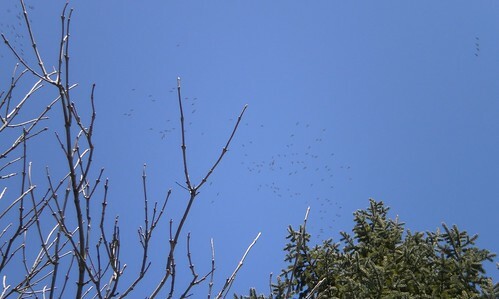 They may be hard to see, but on Saturday, there was this incessant honking over my house as the geese that do migrate began returning to their nesting places. This kind of look like itty bitty ants covering the sky. I couldn't see them in the viewfinder of the camera either so I just kind of aimed in the direction of the honking and depressed the shutter. We all came outside for about an hour, to just sit on the deck or, in the girls' case, smell the smells left over from the winter. It was such a lovely afternoon and I had been cleaning and working through piles since about 10 a.m., so a break had been earned. I need to scrub the top of the deck and restain it this year. I'd also like more flowers than just the three geraniums I have overwintering in the house. That might just be spring talking when you feel energized with the thought of a new year of warmth, having been cooped up through a snowy winter. 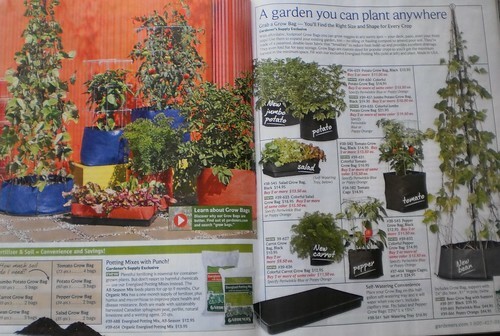 I received a catalogue in the mail last week that has me itching to garden again. Gardener's Supply has some great ideas for the deck. These are great and would be wonderful on my deck. I sat on the top step breathing in the fresh spring air and feeling the warm sun on my face. I looked around and could just see peppers over there and a line of flower pots over here. I love growing peppers in a pot on the deck. There is nothing like a fresh picked pepper. I eat the red, orange or yellow ones raw and they are much sweeter when they are yours than picked from the bin at the grocery. Of course it comes down to not having funds to purchase the things I saw in this catalogue. But I am inspired, right now, to at least consider putting more flowers on the deck this year and actually getting out and enjoying them. 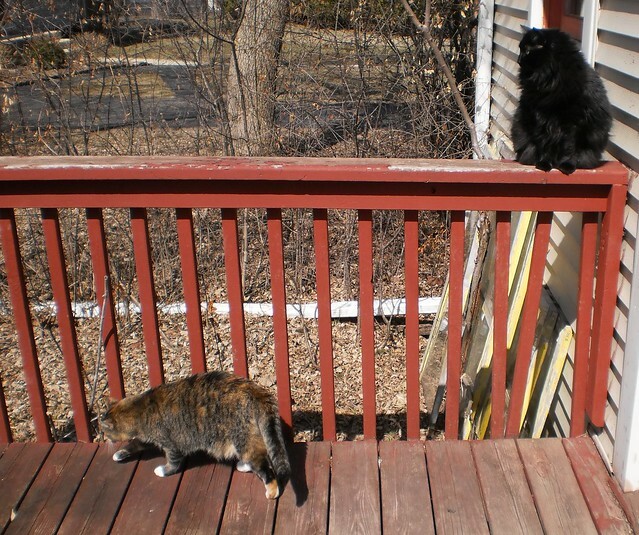 Trusting Pilchard to stay on the deck is an issue but I could always just be outside while they watched from the windows. Mija's pretty good about not straying. Last year at this time, I really didn't care. Flowers were something I liked but I didn't have the energy to deal with them. This year, I'm remembering that sitting on the deck surrounded by plants brought me peace and happiness. I need to recapture that.